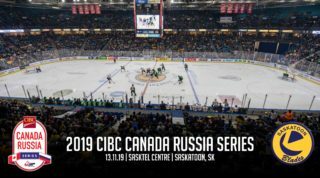 Swift Current, SK – After being eliminated from the playoffs last night, the Saskatoon Blades went into Swift Current on Wednesday night and put forth an admirable effort to defeat one of the best teams in the league by a score of 5-2. The win pulls the Blades to 33-33-3-1 on the season with two more games remaining, both against the Prince Albert Raiders. 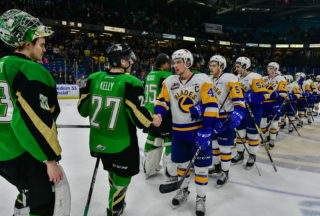 It was a group effort for the Saskatoon Blades but there were a few heroes who helped pull the win together. Veteran netminder Tyler Brown was a wall in the opening period stopping all 12 shots faced giving the Blades a chance to get the offence going. 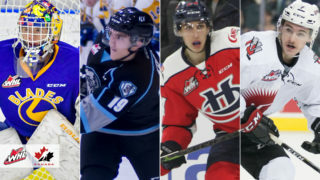 Eventually, Saskatoon broke through in the final minute of the opening period as Kirby Dach scored a highlight reel goal beginning in his own end. Dach created a quick give-n-go play with Eric Florchuk through the neutral zone before going in to snipe his 7th of the season over the glove of Stuart Skinner with just 15 seconds left in the period. The Blades took a 1-0 lead into the first break, trailing 12-4 on the shot clock. After seeing the rookie do his thing, veteran leading scorer Braylon Shmyr increased the lead to 2-0 with his 37th tally of the season at the 4:47 mark of the second. Josh Paterson and Dawson Davidson helped out with assists. However, the Broncos trampled back less than a minute later and then once again on the power play to tie the game midway through the period. Just like in the first period, Saskatoon lit the lamp in the final minute of the second stanza. This time coming on the power play as Michael Farren potted his 11th of the season from Kirby Dach and Max Gerlach, giving the Blades a 3-2 lead after 40 minutes. Still, the Broncos lead on the shot clock 28-17 after firing another 16 shots on Tyler Brown but not having much success. In the final frame the Blades got to work early as Max Gerlach ripped his 30th goal of the season past Skinner just 1:14 into the period. The goal was Gerlach’s 30th of the season; the third consecutive season he has reached or surpassed that milestone. Dach picked up his 3rd point of the evening with the lone helper. Not long after, Gerlach was at it again on the power play. Kirby Dach drew all the attention towards himself on the right side before dishing off to a lonely Gerlach on the back door for a wide open dunk. Gerlach’s 31st gave Saskatoon a 5-2 lead; Kirby Dach added another assist as did Dawson Davidson. Gerlach gets his 2nd of the night on the power play to make 5-2 Blades! The Broncos tried to storm back firing another 16 shots on Brown in the 3rd period but just couldn’t solve the veteran backstop. Brown’s 42 saves on 44 shots earned him 3rd star of the game. 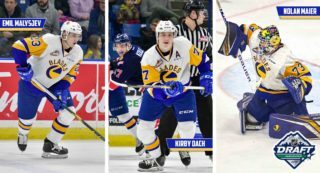 Max Gerlach’s 2 goals and assist were good enough for 2nd star while rookie sensation Kirby Dach was the obvious 1st star after registering his 2nd career 4-point game. 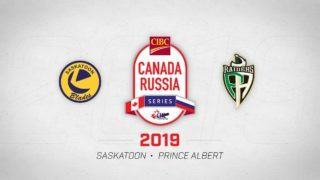 The Blades will now return home for a day of practice before opening up a home & home series with the Prince Albert Raiders on Friday night at the Art Hauser Centre.